Dark-field microscopy is used because it produces high contrast images without staining. Staining blood will destroy it's activity. 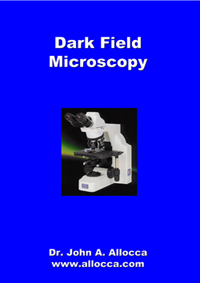 Dark-field Microscopy is a method of evaluating blood while it is biologically active. Blood is obtained by the finger-stick method under sterile conditions and observed using Dark-Field microscopy. There are many cells and substances that can be seen in biologically active blood, including lipids, indicators of toxicity, oxidation, etc. The Dark-Field microscope is an important tool used to evaluate candida albicans overgrowth. This book also covers physiological testing. Dr. Allocca is a highly credentialed, experienced, and honored scientist. The information taught can be found in medical books. Click for Dr. Allocca's biography. Dr. Allocca has been teaching this course for more than 30 years. We teach microscopy and physiological testing. We do not teach an entire course in clinical nutrition. We have included a chapter in the textbook on "Nutritional Guidelines." It is not part of the course and you will not be testing on it. You will learn things like how to identify cells that indicate low iron. But, we don't tell you what to do for low iron. We don't believe one can learn nutrition in a weekend. Furthermore, to be a good nutritionist, one needs to have a good understanding of biochemistry. Don't worry, we have a solution. The Andromeda Assessment and Wellness Plan allows you to fax us your test results. We will process the data and send you back a complete report and wellness plan. Bring your microscopy and physiological testing to a new level with the Andromeda Assessment and Wellness Plan. Call us at 631.757.3919 for more information. In most States only a licensed medical doctor or an employee of a licensed medical doctor can perform microscopic analysis or any kind of laboratory test. Chiropractors in New York and in many other States are not permitted to use microscopy unless they are under the direct supervison of a licensed physician. Call your state "Office of Professional Licensing" to find out the laws in your state. We do not ask for your credentials. The physiological tests required for the Andromeda Assessment and Wellness Plan do not require the same medical license as does microscopy testing. We do not sell microscopes. However, in the course, we recommend specific Nikon microscopes. DO NOT PURHCASE INEXPENSIVE DARK-FIELD MICROSCOPES BECAUSE THEY PROBABLY WON'T WORK FOR BIOLOGICAL APPLICATIONS. EVEN A HIGH QUALITY NIKON MICROSCOPE WITH A DRY CONDENSER (OIL CONDIENSER NEEDED) WILL NOT WORK FOR BIOLOGICAL APPLICATIONS. 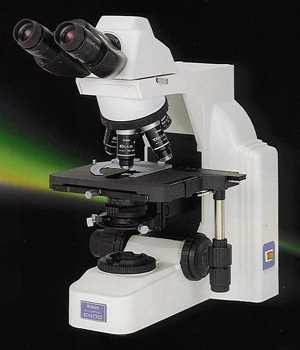 A good quality Nikon microscope, such as the E200-LED configured for dark-field with video will cost approximately $5,800 (list price). Without video, it will cost approximately $3,200 (list price). Morrell Instruments offers a discount. The exact parts list and contact information is in the textbook. The course uses a textbook and a DVD. You may ask questions via email. You will also receive the final exam via email. You will receive a certificate of completion upon passing the final examination. 3. Register for the correspondance training below. 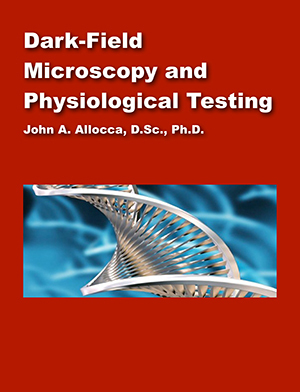 The dark-field microscopy and physiological testing training course is available onsite in Northport, NY by special arrangement for $500, which includes the textbook and DVD. It does not include transportation or lodging. You will spend one day (10 am to 5 pm) with Dr. Allocca learning dark-field microscopy, blood pressure, urinalysis, and core temperature. There will also be a brief discussion of the Neurotransmitter solution and BrainicityTM Transcranial Neural Network Optimizer. You will receive a certificate of completion. There is a minimum of 2 people required for the onsite training class. The nearest airport is Islip McArthur Airport (40 minute drive). The nearest motel is Chalet Motor Inn, 23 Centershore Rd & Route 25A, Centerport NY 11721, (631) 757-4600 (5 minute drive).